Delta Credit Card Review 2019: Why Gold Worth $95? Gold Delta SkyMiles Credit Card Review: Is It Worth It? 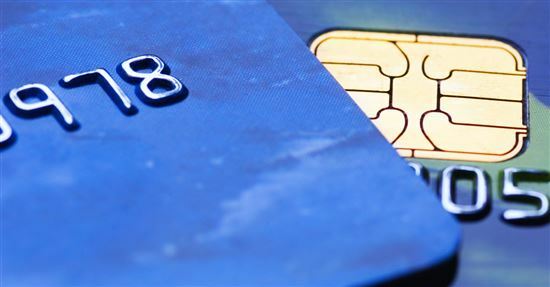 Many airline credit cards let you earn miles. But besides just earning miles, you want benefits too. Benefits that can save you time and money. That's where an airline-branded credit card can come in handy. With the Gold Delta SkyMiles, you can check your first bag free on Delta flights. That is a savings of up to $240 per round trip for a family of four. Plus, you can settle in sooner with Main Cabin 1 Priority Boarding. To start, you must check out the latest Gold Delta SkyMiles promotion. But are these perks worth the annual fee? Read on. 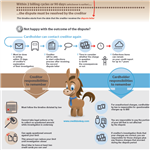 We'll cover the pros and cons of the Gold Delta SkyMiles Credit Card below to help you decide. Did you know: There are 3 different Delta credit cards. The Gold has an annual fee of $95, while the Platinum Delta SkyMiles and Delta Reserve credit card have a $195 and $450 annual fee respectively. Unless you are a big spender, we generally recommend you consider the Gold Delta SkyMiles first. Here's something you may not know: a few credit cards let you transfer points into Delta SkyMiles. The credit card might not specifically say "Delta" on the front, but these other options may be better for you if you want flexibility. Keep in mind that you'll lose Delta-specific perks such as free checked bag and priority boarding. In particular, AMEX Membership Rewards allow you to transfer points to Delta Airlines. Consider looking into the the AMEX Platinum (if you're a frequent traveler), and the AMEX Everyday (for a no annual fee option). American Express is currently offering a 30,000 bonus miles promotion. Here is how it works: New cardholders can earn 30,000 bonus miles after they make $1,000 in purchases within the first 3 months of opening your account. In addition, you can earn a $50 statement credit after you make a Delta purchase within your first 3 months. The spending threshold is relatively straightforward to meet. And it'll give you a head start to racking up miles. Remember, domestic roundtrip award tickets start at 20,000 miles (plus taxes and fees). To take advantage of this promotion, visit American Express' secure website to apply now. When you make a purchase with the Gold Delta SkyMiles card, you earn miles on your account. Delta purchases earn 2 miles per dollar spent (this means eligible purchases from the Delta website and in-flight purchases). Other purchases earn 1 mile per eligible dollar. You can redeem a round trip domestic flight for as little as 20,000 miles (plus taxes and fees). 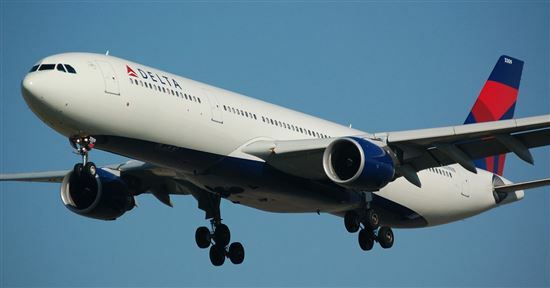 Your miles can also be redeemed for discounts on Delta airfare through Pay with Miles. The number of miles required depends on the price of the ticket (not eligible with Best Fare Guarantee). On airfares greater than $100, generally speaking, 10,000 miles gets you a $100 discount. Besides redeeming miles for award travel, you can redeem miles for upgrades (e.g., upgrading from Main Cabin, aka Economy, to Delta One, First or Business Class). To learn more about the Delta SkyMiles credit card, including the online application, here is a link to American Express' secure website. The Gold Delta SkyMiles card lets you enjoy a number of perks while traveling with Delta airlines. This is where the real money saving comes in. For starters, you'll get to check your first bag for free on Delta flights. This bonus applies for up to 9 travelers on your reservation, which is a significant amount of savings. For a family of 4, that is a potential savings of $240 round trip. Even if you only travel with one other person, the savings on the checked bags will help justify the annual fee. When you book a Delta flight with this card, you also automatically receive Main Cabin 1 Priority Boarding for your flight, even if you don't have status with Delta. This can be useful on packed flights, especially with many passengers looking for space for carry-on bags. 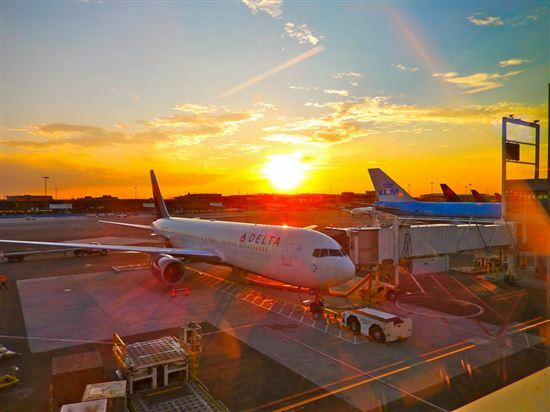 There's more: you can get access to Delta Sky Club airport lounges at a reduced rate of $29 per visit per person (for the cardmember and up to two guests). Certain limitations apply. For instance, effective January 1, 2019, the benefit may only be used when you have a same-day ticketed air travel on a Delta-coded or Delta-operated flight. You get a 20% savings on eligible in-flight items when you use this card. This includes beverages, food, and movies/shows/video games accessed via Delta's seatback in-flight entertainment system during your Delta-operated flight. This savings does not apply to other in-flight purchases such as Wi-Fi. You'll receive the savings as a statement credit 6-8 weeks after the transaction is posted to your account. And lastly, there are no foreign transaction fees (See Rates & Fees), which is a money saver when you use this card when traveling internationally (most credit cards charge a 3% fee). If you would like to apply, visit American Express' secure website for the latest promotion. Besides flight perks, this card offers a number of other benefits as well that may come in handy. Travel insurance: Cardholders have access to insurance against eligible car rental loss or damage and travel accidents. Frequent travelers will find these perks especially valuable, as you can save money on insurance offered by airlines or car rentals. Shopping protection: Cardholders get purchase protection for accidental damage or theft on eligible items. Coverage duration depends on where you live. You can also enjoy extended warranties on eligible purchases. 24-hour roadside assistance: You can call Delta's Roadside Assistance Hotline if you find yourself stranded on the side of the road and need help. 24-hour concierge service: When traveling, a number of issues may come up such as needing cash wires, medical referral, or passport replacement. Delta's 24/7 concierge service can help sort out your problems. You don't fly Delta: If Delta is not your favorite airline or the flights you take rarely involve the airline (or partners), you're not going to get much out of the perks. You may want a more general travel credit card. If you tend to fly American Airlines, take a look at American Airlines credit card instead. If you tend to fly United Airlines, take a look at the Chase Sapphire Preferred credit card instead, which allows you to transfer points (in the form of Chase Ultimate Rewards) to United miles. Read our in-depth review. You don't earn Medallion Qualification Miles (MQMs). Unlike it's higher annual fee siblings, the Gold Delta SkyMiles does not have the opportunity to earn Medallion Qualification Miles (which you need to get to Delta's Medallion status, which comes with even more benefits such as seat upgrades and mileage bonuses). No introductory APR (See Rates & Fees): There's no introductory APR on purchases or balance transfers. If you tend to carry a balance, consider a credit card with a low interest rate instead. The annual fee: The $95 annual fee is competitive for an airline travel card, and it's waived for the first year, but it is an expense you should consider before signing up. The Platinum Card from American Express: Does a $550 annual fee (See Rates & Fees) scare you? For some travelers, the Platinum Card might be worth considering. Instead of the Gold Delta SkyMiles' first checked bag free, you get a $200 airline fee credit to cover up to $200 a year in baggage fees and more at one selected qualifying airline. You also get Global Lounge Collection, which allows you to access 5 airport lounge networks (including Delta Sky Club lounges). But there's more: you earn 5x points for flights booked directly with airlines (including Delta) or with American Express Travel. Plus, you get complimentary Hilton Honors Gold status (requires enrollment). There's a catch: the Platinum Card is a charge card, not a credit card. That means you have to pay in full each month. To start, check out the latest Platinum Card promotion. Introductory Bonus Airline Rewards: Earn 30,000 Bonus Miles after you use your new Card to make $1,000 in purchases within your first 3 months and a $50 Statement Credit after you make a Delta purchase with your new Card within your first 3 months. Airline Rewards: Earn 2 miles for every dollar spent on eligible purchases made directly with Delta. Earn one mile for every eligible dollar you spend on purchases. Airline Rewards: 5X Membership Rewards® points on flights booked directly with airlines or with American Express Travel. Point Rewards: Earn 1 point for virtually every dollar spent. Airline Status: Check your first bag free on Delta flights - that's a savings of up to $240 per round trip for a family of four. Settle into your seat sooner with Main Cabin 1 Priority Boarding. Airline Status: $200 Airline Fee Credit, up to $200 per calendar year in baggage fees and more at one qualifying airline. Terms Apply. Is $550 annual fee too much? Check out the American Express Gold Card instead. Blue Delta SkyMiles has no annual fee (See Rates & Fees). Introductory Bonus Airline Rewards: Earn 30,000 Bonus Miles after you use your new Card to make $1,000 in purchases within your first 3 months and a $50 Statement Credit after you make a Delta purchase with your new Card within your first 3 months. Introductory Bonus Airline Rewards: Earn 10,000 bonus miles after spending $500 in purchases on your new Card in your first 3 months of Card Membership. Airline Rewards: Earn 2 miles for every dollar spent on eligible purchases made directly with Delta. Earn one mile for every eligible dollar you spend on purchases. Airline Rewards: Earn 2 Miles per dollar spent on purchases made directly with Delta. Earn 1 mile on every eligible dollar spent on other purchases. Dining Rewards: Earn 2 miles per dollar at US restaurants. 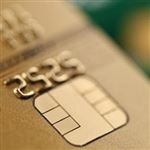 AMEX Everyday: If you rarely travel, it might not make sense to use a card with an annual fee. The AMEX Everyday lets you earn Membership Rewards, which you can then transfer to Delta. It's a good way to rack up points on your everyday spending and trade them in later for a flight. Either $5 or 3% of the amount of each transfer, whichever is greater. $0 balance transfer fee. Airline Rewards: Earn 2 miles for every dollar spent on eligible purchases made directly with Delta. Earn one mile for every eligible dollar you spend on purchases. How often do you fly Delta? If you're a strong fan of Delta, then it's nice to get some perks for your loyalty. 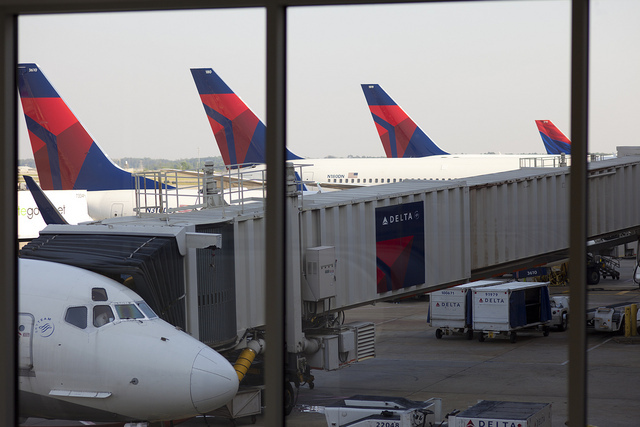 You only need to fly with Delta roundtrip just two times a year (or once a year with a companion), and check in a bag, to justify the $95 annual fee on the Gold Delta SkyMiles card. If you fly very often on Delta every year, you may even want to consider the Platinum or Reserve versions of the card. Do you fly other airlines as well? If you're not a die-hard fan and usually buy flights based on price, you probably want a card that gives you more flexibility. In this case, look for general travel reward cards that let you transfer points to a variety of airline partners. AMEX Membership Rewards lets you transfer to Delta and a ton of other airlines. Just keep in mind that by gaining flexibility, you'll lose perks like free checked bag and priority boarding. How much do you value luxury travel perks? It's nice to get perks such as free checked bags (those fees add up!) and priority boarding. If you like flying Delta and enjoy these basic perks, you'll like the Gold Delta SkyMiles card. If you want luxury perks such as free lounge access, the Delta Reserve ($450 annual fee) gives you access into Delta Sky Club. But in that case, we recommend that you go with the American Express Platinum Card, as it lets you into 5 lounge networks (including Delta Sky Club) along with other perks we cover in our in-depth Platinum review. 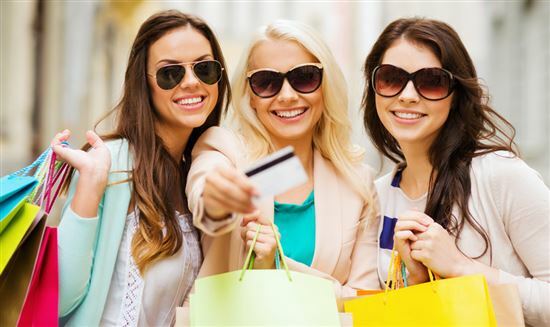 How much do you spend on your credit card? The reward rate isn't high with the Gold Delta SkyMiles card, but the real value is in the free checked bag perk. So you don't need to be a big spender to get value out of using this card. However, if you are a big credit card spender, you may want to look at the Platinum or Reserve versions of this card. Both of those versions have a miles boost bonus. Do you usually travel with a companion? If you usually fly Delta with a travel partner, take a look at the Platinum or Reserve versions of this card. With those, you get a round-trip domestic companion certificate every year. You are still responsible for taxes and fees though. Terms and limitations apply. Bottom Line: Is the $95 Annual Fee Worth It? In our opinion, the Gold Delta SkyMiles is a good airline credit card for someone who often flies with Delta Air Lines (or partners). The rewards rate isn't too high, but the real money savings come in the travel benefits you receive. Getting that first checked bag free on Delta flights is a potential huge money saver. As we mentioned, the $95 annual fee virtually pays for itself even if you travel Delta round-trip just once a year with one other person and plan to check your baggage. Remember, as with all credit card offers, terms and limitations apply. Disclaimer: This content was first published on May 2, 2012. This content may have been updated on March 15, 2019. Information including APR, terms and benefits may vary, be out of date, or not applicable to you. Information is provided without warranty. Please check American Express website for updated information. 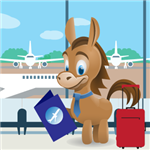 Disclaimer: The information for the The Amex EveryDay® Credit Card from American Express, Platinum Delta SkyMiles® Credit Card from American Express, and Delta Reserve® Credit Card from American Express has been collected independently by CreditDonkey. The card details on this page have not been reviewed or provided by the card issuer.